The texts quoted in Level 3 are directly sourced from the "Opinion on fragrance allergens in cosmetic products", produced in 2012 by the SCCS (Scientific Committee on Consumer Safety) of the European Commission. Levels 1 & 2 were written by Dr. Marisa Fernandez in collaboration with the editorial team of GreenFacts and the DG Health and Consumers of the European Commission. As a result of a public consultation on perfumery materials, which ended on 27 January 2007, there were further requests and information on important and/or frequently used allergens other than those proposed for regulation, such as farnesol, citral, linalool and hydroxyisohexyl-3-cyclohexenecarboxaldehyde. These substances were not part of the consultation, but they all belong to the 26 fragrance substances which should be labelled when present in cosmetic products under certain conditions. The 26 fragrance substances were introduced into annex III of the Cosmetics Directive by the 7th amendment (2003/15/EC) on the basis of the SCCNFP draft opinion (SCCNFP/0017/98) published on 30 September 1999 for public consultation and the final opinion adopted by the SCCNFP during the plenary session of 8 December 1999. Thirteen of the allergenic fragrance substances listed in this opinion have been frequently reported as well-recognised contact allergens in consumers and are thus of most concern; 11 others are less well documented. See the lists below from the opinion. At the time there were insufficient scientific data to allow for the determination of dose response relationships and/or thresholds for these allergens. Nevertheless, in a pragmatic administrative decision the limits of 0.01 and 0.001% were set, for rinse-off and leave-on products respectively. Scientific information of both a general and a specific nature has been submitted to DG ENTR in order to ask the SCCS for a revision of the 26 fragrances with respect to further restrictions and possible even delisting. 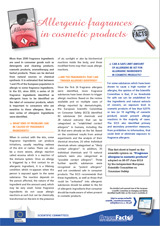 The "Opinion on fragrance allergens in cosmetic products", was adopted by the SCCS on 26-27 June 2013. Does the SCCS still consider that the fragrance allergens currently listed in Annex III, entries 67-92, for labelling purposes represent those fragrance ingredients that the consumer needs to be made aware of when present in cosmetic products? Can the SCCS establish any threshold for their safe use based on the available scientific data? Can the SCCS identify substances where processes (e.g. metabolism, oxidation and hydrolysis) may lead to cross-reactivity and new allergens which are relevant for the protection of the consumer? The Three-Level Structure used to communicate this SCCS Opinion is copyrighted by Cogeneris sprl.